Understanding today’s political theater – with shifting allegiances, back-stabbing, and “dark money” contributing to steer the ship of state – firmly requires looking back to look forward. Identifying patterns of corruption from the past enables us to interpret those of today and suspect what may occur in the future. 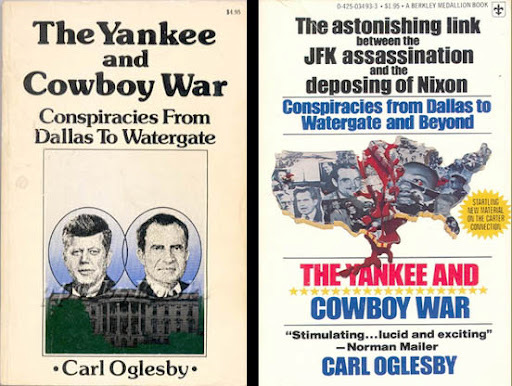 One of the very best books that gives us leads to follow is “The Yankee and Cowboy War” by Carl Oglesby. First published in 1976, the book is a great example of a “big picture” analysis of the hidden history of the United States from World War 2 to the election of President Carter. By labeling it a “big picture” analysis, we should understand that Oglesby strings together a series of events, groups and individuals that might appear unrelated in conventional perspective. In Yankee/Cowboy, Oglesby has boldly put forward the theory that in the 1960’s America has suffered the biggest split since the Civil War. In careful, heavily footnoted chapters he lays out the emerging conflict between the eastern establishment (Yankees) who are “Atlanticist” – tied to Western Europe by design – pitted against the emerging wealth and power of the southwest and western states (The Cowboys). Oglesby introduces us to the idea that as early as the late 1800’s the “Round Table” of Cecil Rhodes sponsored a plan to reunite England with “the colonies” (which has largely happened) in a scheme which dominated government and trade for nearly a hundred years. However with the discovery of oil, the growth of defense industries, big agriculture and the experience of westward expansion brought with it the challenge of “The Cowboys”. Oglesby clearly differentiates this theory from that of (for instance) the early John Birch Society. While the Birchers saw an over-arching global communist cabal, Oglesby envisions America as a super-state that has been cleaved, with opposing forces in a power struggle that actually did mean life or death. Nowhere is this more evident than in the assassination of President Kennedy, a representative of the old-school eastern establishment who betrayed his class affiliation and moved to rein in his military and CIA. The CIA, itself a product of the ivy-league east, found new co-conspirators in the deep pockets of Howard Hughes and the incorporation of the Gehlen Nazi spy operation that was welded to the CIA in the anti-Soviet era. JFK was killed, Vietnam escalated, Robert Kennedy, Martin Luther King and Malcom X were eliminated. The Black Panthers and American Indian movement were wiped off the map. The takeover was almost complete, but President Nixon stood in the way. Oglesby was one of the first authors I read that wove all these events together in an obvious and sensible way. Of course Watergate was connected to the Kennedy assassination, the same individuals were involved. This is what I mean by “big picture”. While younger readers may see the above list as remnants of ancient history, these subjects repeat themselves on a regular basis; the current implosion of our two-party system, the new money and power of the Koch brothers, the gun and drug running of Iran-Contra, the privatization of our military and spy networks, and – in what is this generation’s Kennedy assassination – the events of 9/11. If you are lucky enough to get your hands on a copy of the original book, you will never forget it. It will frame the view of every para-political event you will experience. If you can’t find the book, start with the link provided above, it appears to be a very good summary. This entry was posted on May 8, 2016 at 7:27 pm and is filed under Book review, Hidden History, Tell the truth and run !. You can follow any responses to this entry through the RSS 2.0 feed.